The 2017 American Music Awards just got a big dose of star-power with the unveiling of collaborations featuring Alessia Cara and Zedd, as well as Hailee Steinfeld and Alesso featuring Florida Georgia Line and watt. The show will broadcast live from the Microsoft Theater in Los Angeles on Sunday, Nov. 19 at 8 p.m. E.T. on ABC. The 2017 MTV European Music Awards are back again on Sunday, November 12 to celebrate a night of music, and award some of the hottest musicians in the world. 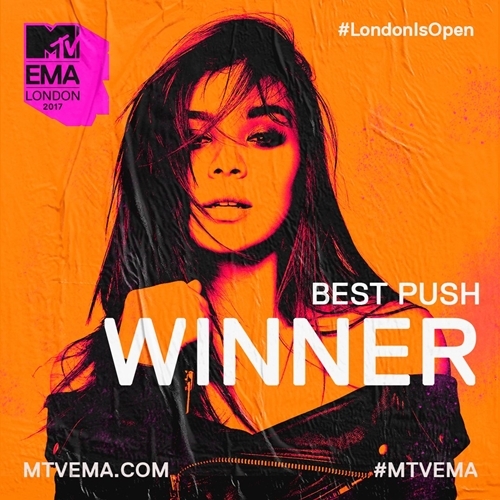 Congrats Hailee for the MTV EMA “Best Push” artist win!